A regular breeding species and migrant. The Olive-sided Flycatcher was an uncommon species during the Minnesota Breeding Bird Atlas (MNBBA). The Olive-sided Flycatcher ranges from Alaska across boreal Canada, south along the temperate coniferous forests of the Pacific Northwest and the Rocky Mountains, and east across the Great Lakes and New England. Sparsely distributed throughout its range, some of its highest breeding densities are found along the Pacific Coast (Figure 1). Assigned a Continental Concern Score of 13/20 by Partners in Flight and designated a Yellow Watch List species; designated a Species in Greatest Conservation Need by the Minnesota Department of Natural Resources. A long-distance, Neotropical migrant that winters in Central America and northern South America. An aerial insectivore that sallies from high perches to feed on flying insects. An open-cup nest placed in the tree canopy, usually on a horizontal branch away from the tree trunk; coniferous trees are preferred but deciduous trees are occasionally used. Breeding distribution and relative abundance of the Olive-sided Flycatcher in North America based on the federal Breeding Bird Survey from 2011 to 2015 (Sauer et al. 2017). Roberts (1932) described the Olive-sided Flycatcher as a “common summer resident throughout the evergreen forests, where it breeds as far south as northern Isanti and Pine counties and as far west as Itasca Park and eastern Marshall County.” Nevertheless, confirmed breeding records (nests with eggs or flighless young) were only available from Cass and Itasca Counties and an inferred nesting record (nest just completed) from Cook County. A nesting record from Isanti County is also included from June 13, 1927, but the text only mentions the observation of an adult bird; there is no mention of a nest. Robert’s brief account of this flycatcher is devoted largely to a description of the bird’s characteristic “song.” Field ornithologists in the early 1900s variously described its mnemonics as come-right-here, put-take-care, or quip-peer-peer, but nowadays quick-three-beers is the most beloved rendition in its North Country haunts. By 1975, Green and Janssen’s updated account of the species described its breeding range as “the northeastern and north central regions as far west as Kittson County and Mary Point Lake, Becker County, and as far south as Sturgeon Lake, Pine County.” Because the Olive-sided Flycatcher is a late migrant that often lingers in southern Minnesota through early June, the authors discounted Roberts’s 1927 record in Isanti County, classifying this record as a late spring migrant rather than of a summer resident (Green and Janssen 1975). In addition to Robert’s nesting records from Itasca, Cass, and Cook Counties, they added an inferred nesting record from Carlton County. A few years later, Janssen (1987) delineated three counties where nesting had been confirmed since 1970: Aitkin, Clearwater, and Cook. In their publication of updated county nesting records, Hertzel and Janssen (1998) deleted the Clearwater County record. Although work had yet to be completed in the far north-central counties of Minnesota, which provides prime habitat for the Olive-sided Flycatcher, records collected by the Minnesota Biological Survey (MBS) by 2014 documented a similar distribution to that delineated by earlier accounts. Breeding season observations were documented as far south as northern Pine County in the east and northern Wadena County in the west (Minnesota Department of Natural Resources 2016). During the MNBBA, observers reported a total of 217 Olive-sided Flycatcher records from 3.5% (168/4,736) of the surveyed atlas blocks and from 3.9% (90/2,337) of the priority blocks. Breeding was confirmed only in one block (Figures 2 and 3; Table 1). Olive-sided Flycatchers were observed in 18 of Minnesota’s 87 counties and were confirmed breeding in Lake of the Woods County, a new county nesting record since the early 1900s. With the exception of two records discussed below, all atlas records were located within the Tallgrass Aspen Parklands and Laurentian Mixed Forest Ecological Provinces. Two atlas records occurred south of the region traditionally recognized as the flycatcher’s breeding distribution in Minnesota, specifically records in Todd and Sherburne Counties. These records were examined closely before including them in the final Minnesota atlas map. As noted earlier, the Olive-sided Flycatcher migrates very late in the spring, often passing through southern Minnesota the first week of June or later. This late migration prompted atlas staff and technical advisors to carefully review all reports from central regions of the state. Several June records south of Lake Mille Lacs were invalidated as likely late migrants. The 2012 “probable” record from Todd County was retained because of two valid probable observations in the same block and in the same general location in 2013—one in early July and one in early August. Close examination of satellite images of the site also suggested that it provided ideal habitat for the flycatcher. A confirmed nesting record from the same block in 2010 was downgraded to “possible” because it represented a significant range extension and because supporting documentation was not submitted. Nevertheless, together the three records strongly suggest that the block is suitable for nesting for the Olive-sided Flycatcher. The second record south of Lake Mille Lacs was in Sherburne County in 2011. There were multiple “possible” observations of the species in this block over a three-year period, ranging from mid to late June and each by skilled observers; four of the five records were from the MBS. The entire block is located within the Sherburne National Wildlife Refuge and also appears to provide suitable habitat. The predicted distribution map combines the MNBBA data with data on climate, habitat availability, landscape context, and species detectability to produce a model that predicts the likelihood of encountering the species statewide (Figure 4). Like several other wetland-associated species, the extensive wetlands north of Red Lake are predicted to support some of the highest breeding densities, as are some of the extensive peatlands in southern St. Louis County. Although this map does not preclude the validity of the atlas records in Todd and Sherburne Counties, it does suggest that records in central Minnesota require careful documentation. Overall, it appears the Olive-sided Flycatcher’s current breeding distribution in Minnesota is remarkably similar to that originally described by Roberts nearly one hundred years ago. Elsewhere in its range, the species is still reported in small areas within the southern Appalachian Mountains but is largely extirpated from West Virginia, Virginia, Maryland, Tennessee, and North Carolina. Range contractions also have occurred in New England and Nova Scotia. By contrast, populations appear to have expanded in other regions of Canada’s Maritime Provinces and in northern California (Altman and Sallabanks 2012). More recently, Michigan and Ontario reported declining numbers of birds but similar distributional ranges between atlases conducted in the 1980s and again in the first decade of the twenty-first century (Cadman et al. 2007; Chartier et al. 2013). Breeding distribution of the Olive-sided Flycatcher in Minnesota based on the Breeding Bird Atlas (2009 – 2013). Summary statistics of observations by breeding status category for the Olive-sided Flycatcher in Minnesota based on all blocks (each 5 km x 5 km) surveyed during the Breeding Bird Atlas (2009-2013). Summary statistics for the Olive-sided Flycatcher observations by breeding status category for all blocks and priority blocks (each 5 km x 5 km) surveyed during the Minnesota Breeding Bird Atlas (2009-2013). Predicted breeding distribution (pairs per 40 hectares) of the Olive-sided Flycatcher in Minnesota based on habitat, landscape context, and climate data gathered during the Minnesota Breeding Bird Atlas (2009-2013) using the General Linear Modeling method with an adjustment for detectability. A northern forest species, the Olive-sided Flycatcher is found in coniferous forests with natural or anthropogenic forest openings and edges. Openings or edges may be along streams, rivers, or wetlands, or they may be the result of fires, blowdowns, the establishment of beaver meadows, insect infestations, or timber-harvesting activities (Altman and Sallabanks 2012; Cutright et al. 2006; Kotliar 2007). The most important habitat feature is the presence of tall trees or snags used for scouting insects, singing perches, and nesting. Young successional forests may be used if residual mature trees are left standing and water features are nearby (Kreitinger and Paulios 2013). In Minnesota the trees most frequently used for nesting and feeding are large pines, spruce, or tamarack (Danz et al. 2007). A long-term study of forest birds on four national forests in Wisconsin and Minnesota, the National Forest Bird (NFB) monitoring program, found that the species was most strongly associated with sedge wetlands (Figure 5). The association was attributed to the connection of sedge wetlands with beaver flowages and the presence of large trees along the edges (Niemi et al. 2016). Habitat data collected within 200 m of MNBBA point counts where Olive-sided Flycatchers were detected demonstrates the species strong association with northern bogs (Figure 6). High densities of the Olive-sided Flycatcher are often found in recently burned landscapes, suggesting that in the pre-European landscape the species was entirely dependent on transitional, post-burn habitats. Habitat created by managed forest openings may actually represent suboptimal habitat (Hutto 1995). Typical breeding habitat of the Olive-sided Flycatcher in Minnesota (© Gerald J. Niemi). Habitat profile for the Olive-sided Flycatcher based on habitats within 200 m of point counts where the species was present during the Minnesota Breeding Bird Atlas (2009-2013). Using data collected by the federal Breeding Bird Survey (BBS) biologists have generated a population estimate of the North American Olive-sided Flycatcher of 1.9 million breeding adults (Rosenberg et al. 2016). A few years earlier, Minnesota was estimated to support 0.3% of this population (Partners in Flight Science Committee 2013), which, applied to the 2016 population estimate, results in a statewide population of approximately 5,700 adults. The Olive-sided Flycatcher is an uncommon forest inhabitant in Minnesota and rarely reaches high densities anywhere within its breeding range. Even Roberts’s brief account (1932) of the species suggested that it has always been sparsely distributed. For example, BBS routes in Minnesota average less than 1 Olive-sided Flycatcher detection per route each year. But in several ecological regions in the Pacific Northwest, an average of 4 to 5 flycatchers were observed per route (i.e., the Northwestern Interior Forest and the Northern Pacific Rainforest); in the Sierra Nevada region of northeastern California observers reported an average of nearly 14 birds per route (Sauer et al. 2017). Few data are available for comparison but in northern Minnesota Olive-sided Flycatcher breeding densities averaged 0.15 pairs per 40 ha across the Chippewa National Forest and 0.05 pairs per 40 ha on the Superior National Forest (Niemi et al. 2016). Slightly higher densities were reported in the Agassiz Lowlands Subsection where 0.5 pairs per 40 ha occurred in productive black spruce-tamarack bogs and in lowland forests infested with Eastern larch beetles (Bednar et al. 2016). Since 1966, the BBS has documented a significant population decline of 3.10% per year throughout the United States and southern Canada (Figure 7). Because of the species’ low relative abundance in Minnesota, the projected trend line lacks statistical precision but also suggests a strong decline. Indeed, there is no ecological region, province, or state where the population of the Olive-sided Flycatcher is increasing (Sauer et al. 2017). Overall, since 1970, biologists estimate that the population has declined by 78% (Rosenberg et al. 2016). This declining trend in population is also evident in the national forest monitoring efforts that have been conducted on Minnesota’s national forests for the past twenty years (Bednar et al. 2016). The birds are experiencing a nonsignificant decline in the Chippewa National Forest and a significant decline in the Superior National Forest. When data for the two forests are combined, the regional trend is a significant decline averaging 4.19% per year (Figure 8). Factors potentially contributing to the range-wide decline include: 1) reductions in the availability of snags in its preferred habitats, 2) decreased populations of beaver, resulting in fewer forest wetlands with snags, especially in the northeastern United States, 3) forest fire suppression efforts, 4) overall habitat loss, and 5) habitat loss along migration routes or on its wintering grounds (Danz et al. 2007). Habitat loss on wintering grounds is a particular concern. A Neotropical migrant, the Olive-sided Flycatcher winters primarily from Panama south through northern South America. Densities are highest in the Andean mountain range of Columbia (Altman and Sallabanks 2012). An estimated 85% of the forests in the Andes have been lost or altered (Orejuela 1985), leading one prominent biologist to predict the species could lose 39% of its winter habitat within the twenty‑year period between 1980 and 2000 (Diamond 1991). Finally, the entire guild of aerial insectivores has experienced significant population declines since the BBS began in 1966. The decline has been most notable in the eastern United States and is significantly larger than that observed for other songbirds. Aerially borne pollutants that reduce the calcium available to insects is thought to be a primary factor responsible for the insects’ decline, directly impacting the abundance of aerial insectivores (Nebel et al. 2010). 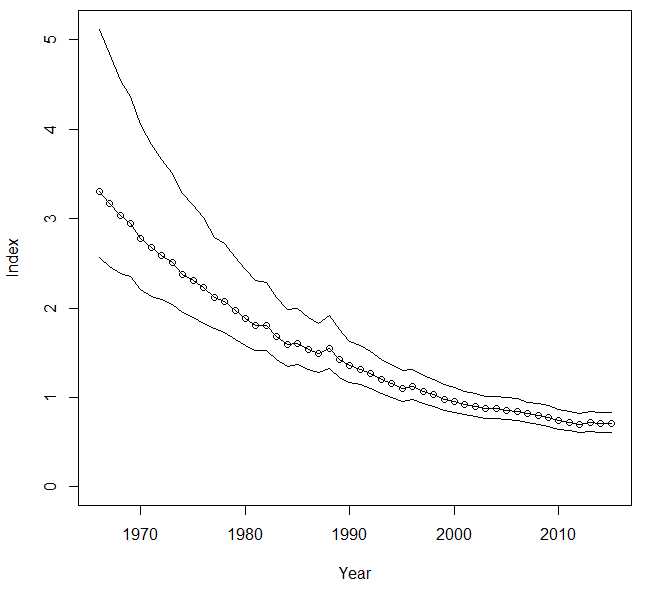 Breeding population trend for the Olive-sided Flycatcher in North America from 1966-2015 based on the federal Breeding Bird Survey (Sauer et al. 2017). 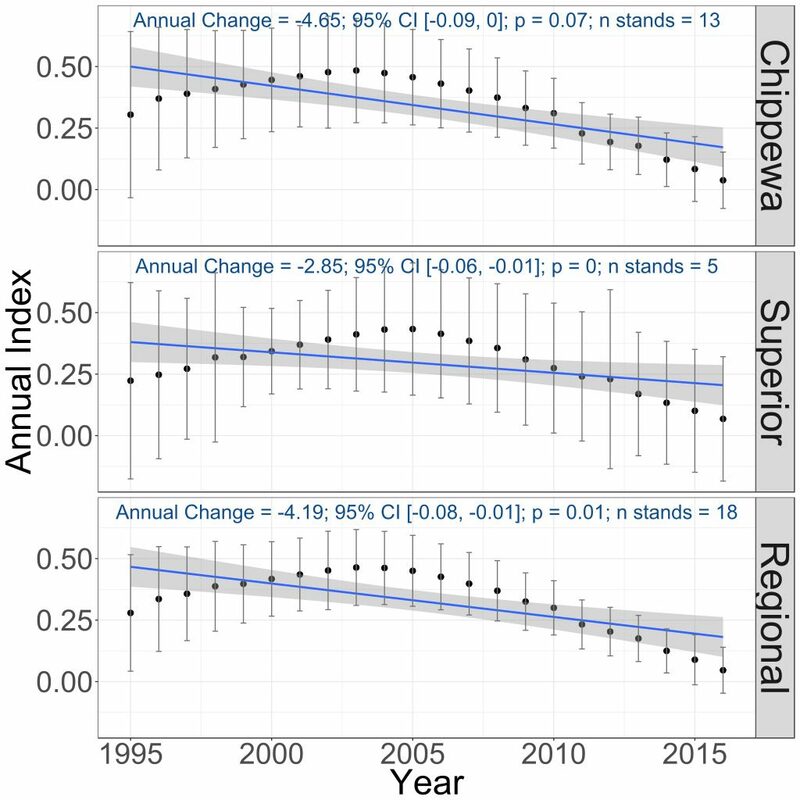 Breeding population trends of the Olive-sided Flycatcher in the Chippewa and Superior National Forests and the combined regional trend, 1995–2016 (Bednar et al. 2016). Potential threats on both breeding and nonbreeding grounds, coupled with its long-term population decline, are responsible for the Olive-sided Flycatcher’s relatively high Continental Concern Score of 13/20 by Partners in Flight. They also have classified the species as a Yellow Watch species, a designation reserved for twelve North American birds that “require constant care and long-term assessment” to prevent further declines (Rosenberg et al. 2016). In Minnesota, the species was designated a Species in Greatest Conservation Need by the Minnesota Department of Natural Resources (2015) and is on the regional forester’s Sensitive Species List for both the Chippewa and Superior National Forests (U.S. Forest Service 2012). Regionally, the Partners in Flight conservation plan for the Boreal Hardwood Transition Region, which includes northern Minnesota, identified the Olive-sided Flycatcher as one of three priority species in the region’s forested habitats (Matteson et al. 2009). Because of its low numbers and the poor accessibility of some of its prime lowland habitats, few studies have identified best management practices critical for maintaining populations. Recommendations generally focus on protecting existing sites that provide suitable habitat, retaining snags and tall trees in harvested stands, and insuring the availability of forest openings in appropriate habitats at the landscape scale (Kreitinger and Paulios 2013). Although habitat loss and degradation is considered the most significant threat to the species, the impact of warming temperatures is another concern for boreal-nesting species such as the Olive-sided Flycatcher. Impacts to species that nest in boreal forests are predicted to be greater than the impacts to species that depend on temperate or tropical forests further south. As northern forest trees shift their ranges northward, the overall extent of the boreal forest will likely decrease. Populations on the southern periphery of the species’ range, such as the Olive-sided Flycatcher in northern Minnesota, are predicted to recede northward in response to changes in forest composition. A preliminary assessment of the flycatcher’s vulnerability to climate change has ranked it as moderately vulnerable (North American Bird Conservation Initiative 2010). Clearly, the future of this habitat specialist and proclaimed “lover of high places” in our northern forests (Roberts 1932) is fraught with challenges and is not guaranteed in the long-term. Diamond, Antony W. 1991. “Assessment of the Risks from Tropical Deforestation to Canadian Songbirds.” Transactions of the North American Wildlife and Natural Resources Conference 56: 177–194. Hutto, Richard L. 1995. USFS Northern Region Songbird Monitoring Program: Distribution and Habitat Relationships. USFS Contract R1-95-05. Report to U.S. Department of Agriculture Forest Service, Region 1. Kotliar, Natasha B. 2007. Olive-sided Flycatcher (Contopus cooperi): A Technical Conservation Assessment. Report to U.S. Department of Agriculture Forest Service, Rocky Mountain Region. Orejuela, Jorge E. 1985. “Tropical Forest Birds of Colombia: A Survey of Problems and a Plan for Their Conservation.” In Conservation of Tropical Birds: Proceedings of a Workshop and Symposium Held at the 17th World Conference of the International Council for Bird Preservation, 7, 8, and 10 August 1982, Kings College, Cambridge, England, edited by Antony William Diamond and Thomas E. Lovejoy, 95–114. ICBP Technical Publication, no. 4. Norwich, England: International Council for Bird Preservation.